Chadbourn was primarily a landscape painter, whose work was nationally known for its intense use of color. He wrote two well-regarded books about painting, and his work is in numerous public collections, including the Art Institute of Chicago and Boston’s Museum of Fine Arts. He was an instructor at the Famous Artists School. 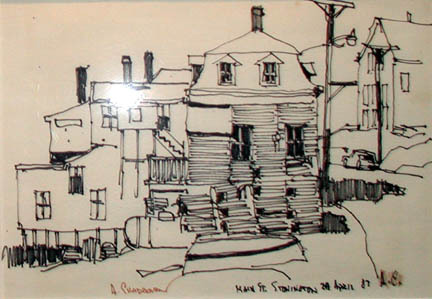 Chadbourn, Alfred Cheny (Chip), “Main Street Stonington,” Westport Public Schools Digital Collections, accessed April 24, 2019, https://collections.westportps.org/items/show/521.